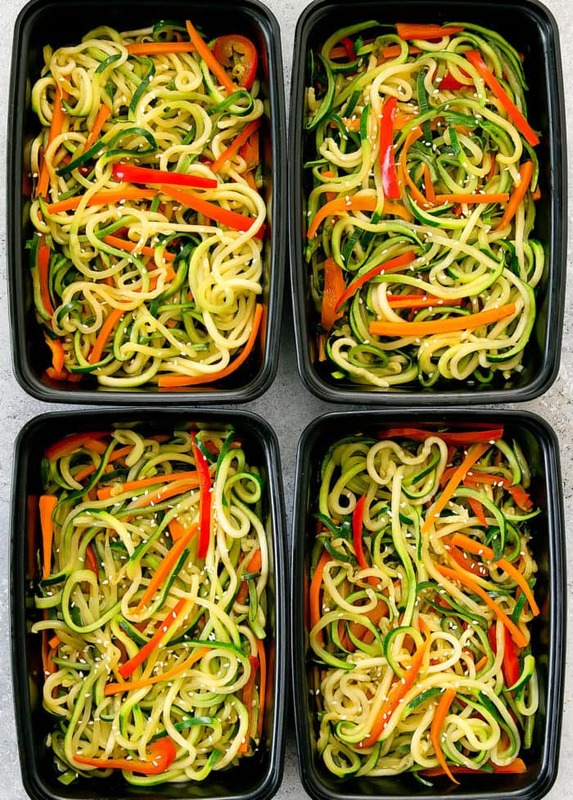 Stir fried zucchini noodles is a healthier and low carb version of chow mein that can be made ahead of time for your weekly meal prep. Lately, I’ve been craving chow mein. 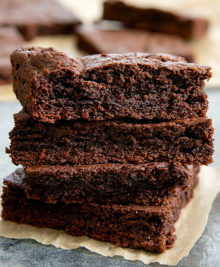 I had it for several days in a row without getting sick of it and while I would have gladly eaten more, I also wanted to eat a little lighter. 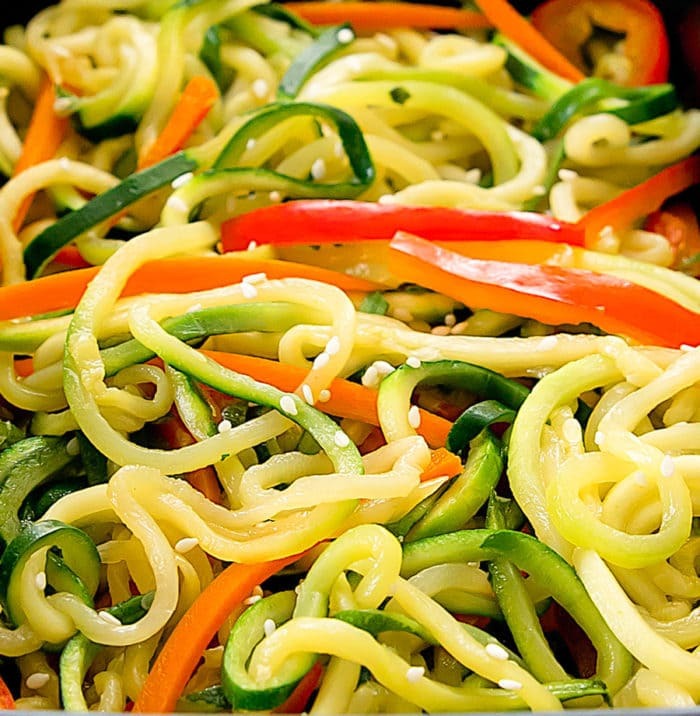 Enter zucchini noodles chow mein. This lighter version retains a lot of the same flavors, but it’s a healthier dish. It’s easy to make and perfect for meal prep. For this version, I used the finer spirals on my spiralizer*. I was in the mood for some skinny spaghetti-like noodles. 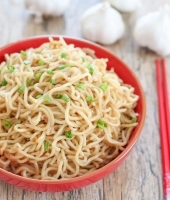 I love how much these look like real noodles! 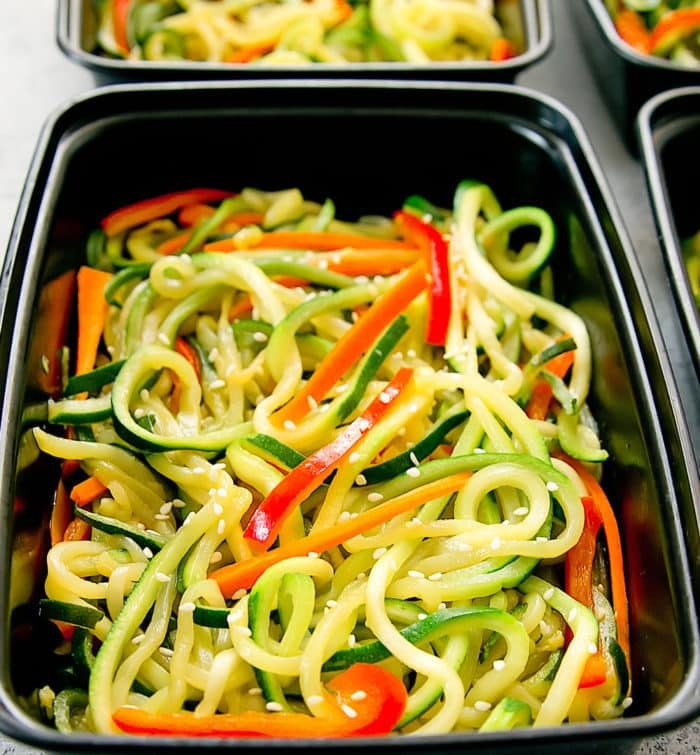 A lighter and low carb version of chow mein that can be made ahead of time for your weekly meal prep. In a large skillet or wok, add oil and garlic. Bring pan to medium high heat and cook about 1 minute until garlic is lightly browned. Add carrots and bell peppers to pan. Cook until tender but still crispy. Reduce heat to low heat. Add zucchini back in along with soy sauce, sesame oil and oyster sauce. Stir until everything is evenly combined in sauce. Taste and adjust as needed. Be careful to not cook at high heat because it will cause the zucchini to release more water. When everything is evenly cooked and coated in sauce, remove pan from heat. Drain any excess liquid if needed. Garnish with white sesame seeds. Allow everything to cool before placing into meal prep containers. 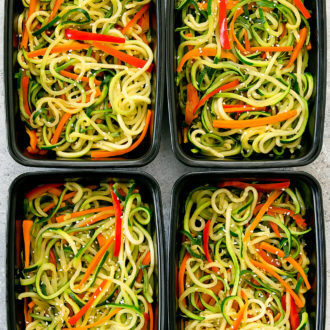 I use these Meal Prep Containers* and this spiralizer*. Looks like a great and healthy meal! My husband likes the spiralizer. When he uses it, his “zoodles” are often unbroken, unlike mine, haha.